From Toyroom Gallery as posted on Expressobeans.com: This edition was used to advertise the show around town. The majority have tack hole, tape and other use marks. There were a few sold. This old-based ink edition is more transparent while the water-based edition is more opaque. 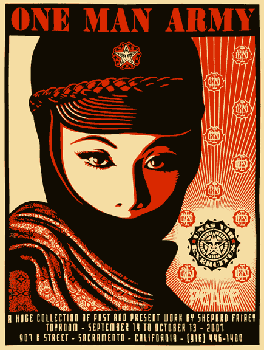 From Toyroom Gallery: "Toyroom asked for and received permission to use certain images from Shepard Fairey. Being very gracious and accommodating he not only authorized us to do so... we were given the image files so we "got it right" as far as color and image sharpness. We were also denied an image that we wanted to use for this particular show, and were given a choice between a few others. There were things added such as show titles, dates, etc."